Here are the facts: most floors will, at some point, need to be replaced. Paint peels. Sheet flooring will hold up to friction and high traffic for only so long. Concrete, once exposed to water and temperature extremes, will crumble and chip. If your floor starts to come apart, it’s only a matter of time before you’ll need a total rehaul. Most flooring materials are sold in sheets, which can be shaped to fit around equipment, drains, and metal protrusions. Individual sheets are then glued to the substrate and set to dry. Over time high traffic, leaks and spills dissolve the adhesive attaching it to the floor. The sheeting pulls apart like wet paper, and solving this problem is no quick-fix! At some point you’ll have to rip it all up and refurbish the entire floor. But what if you had a choice? The Everlast® Floor is one of the greenest floors available. For starters, it’s made with natural marble and organic resins. It’s also free of toxic solvents and thinners, which create polluting vapors when they evaporate. The Everlast Epoxy resin forms a 100% non-porous barrier between your floor and your worst spills and leaks. Pests have nowhere to hide, and are easy to get rid of. Because of our seamless design, cleaning an Everlast floor naturally requires less water. And an FDA-approved antimicrobial additive repels bacteria and fungi, keeping your area safe and sanitary. Keep in mind that powerful, polluting disinfectants are unnecessary on an Epoxy Floor- soap and water works just fine. 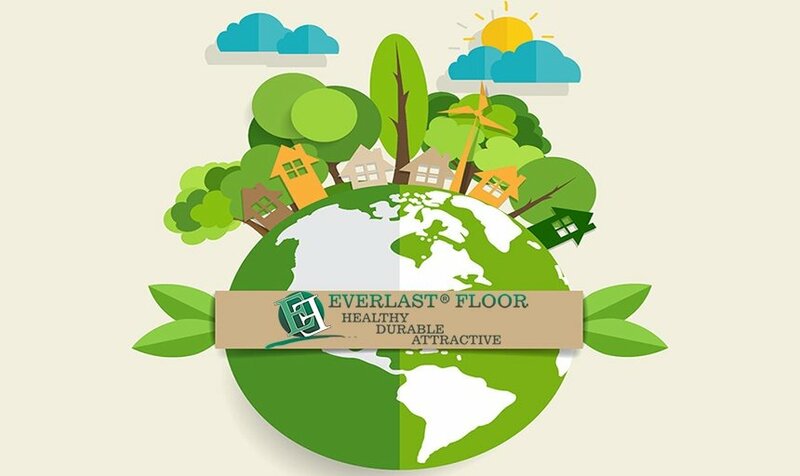 What makes the Everlast Floor so environmentally friendly is its durability. Equipped to handle the roughest treatment, our floors will never crack, chip, flake, or crumble. Our Everlast floors have been used in gymnasiums, kitchens, dormitories, homes, and public bathrooms, and get a lot of tough love. With the right care our floors last a lifetime, so no excess material has to go to a landfill. If that’s not enough, we offer the Everlast Epoxy Eco Floor, which substitutes our natural marble chips with ground recycled glass. This helps reduce our environmental impact and adds a stunning 8 new colors to our flooring palette! These days we’re thinking greener. Everlast Epoxy Flooring does its part to keep our planet healthy and sustainable. To find out more about the Everlast Epoxy Floor, call 1 (800) 708- 9870, or visit our website Epoxy Flooring that is Environmentally Friendly.